The property features a 17-story, 450,000-square-foot tower located in the heart of Boston's Seaport District. 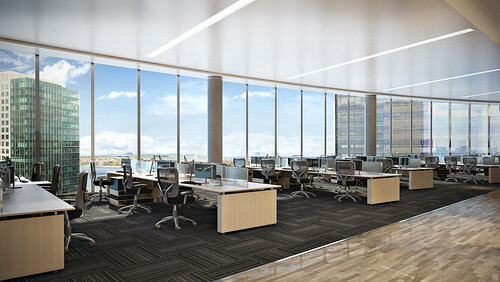 121 Seaport features 400,000 square feet of Class A office space above a two-story, 50,000-square-foot retail podium. 121 Seaport is 100%-leased, with tenants including Internet of Things (IoT) technology provider PTC, who has leased 250,000 square feet, and Alexion Pharmaceuticals, who has leased 150,000 square feet. Both tenants will open new global headquarters at 121 Seaport. 121 Seaport tenant amenities include a private fitness center and a rooftop terrace with sweeping skyline and harbor views. 121 Seaport has seven high-speed elevators plus one service elevator; elevators will feature Destination Dispatch technology for reduced travel times. 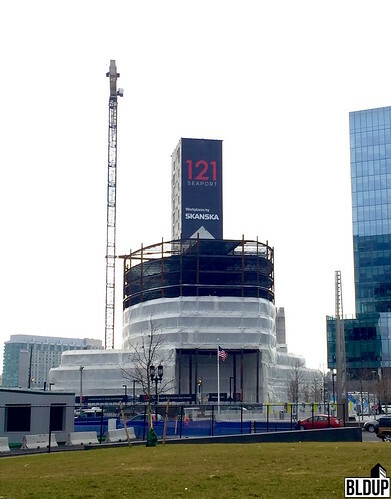 121 Seaport is targeting LEED Platinum efficiency certification; the building's elliptical design will result in 15 percent energy savings due to less direct solar exposure. 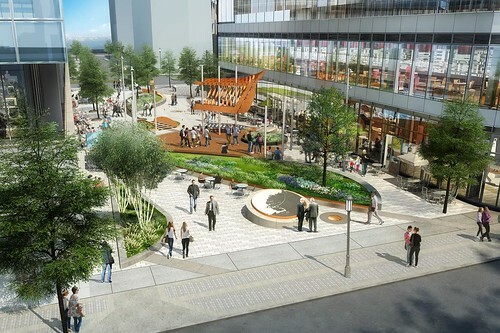 Harbor Way, a 70-foot wide pedestrian retail promenade with 20,000 square feet of tree-lined open space, will be located at 121 Seaport's base. The promenade will feature an interactive pedestrian museum honoring the history of the Seaport District's development. Underneath 121 Seaport will be a parking garage with space for approximately 270 vehicles and 270 bicycles. The Boston office of Cresa, the world’s largest occupier-focused commercial real estate firm, and Margulies Perruzzi Architects (MPA), one of New England’s most innovative architectural and interior design firms, today announced the completion of a new 250,000 SF global headquarters for PTC Inc.(PTC), a global provider of technology that transforms how companies design, manufacture, operate, and service things in a smart connected world. PTC relocated its headquarters from Needham, Mass., to 121 Seaport Boulevard, a newly constructed 17-story, 400,000 SF office building in Boston’s Seaport District. The building recently received the USGBC’s Leadership in Energy and Environmental Design (LEED) Platinum certification, its highest level of sustainability achievement. 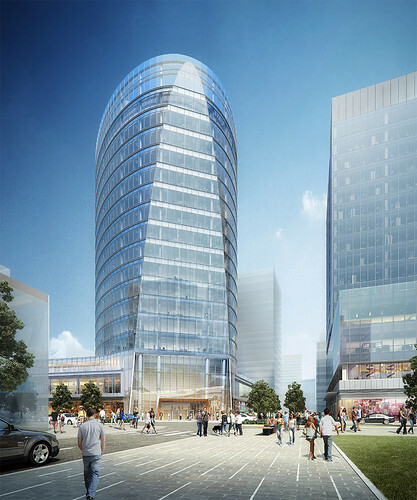 MPA’s design for PTC’s headquarters was strongly influenced by the unique, elliptical-shaped glass tower of 121 Seaport. To maximize views of Boston Harbor and downtown Boston, the open office design places conference rooms and meeting spaces around the building core on each floor, and arranges bench seating with ergonomic sit-to-stand desks in a radial fashion that aligns with the oval shape. More than 200 technology-enabled collaboration and huddle rooms support PTC’sactivity-based workplace, which has no private offices and no assigned seats, encouraging employees to work where they want. Open-seating collaboration areas and touchdown spaces anchor the north and south end with a variety of seating styles. On every floor, a themed work café/coffee space, each dubbed “The Hive,” offers employees a diverse experience for casual meetings, socialization, and quiet time. Gigantic curved LED light fixtures span the arc on each floor, with colored lights on the 17th floor providing a dramatic view from the street at night. With its convergence of digital and physical features and a layout that encourages employees and customers to co-mingle, the 17th floor is at the forefront of PTC’s new headquarters design. The world-class CXC provides visitors with a customized, hands-on tour to experience a world powered by PTC’s Industrial Internet of Things, Augmented Reality, Product Lifecycle Management, and 3D CAD technologies. This is made possible through a combination of state-of-the-art meeting space and more than 20 experiential exhibits showcasing customer and partner innovations. These exhibits dynamically demonstrate PTC’s technology by using Augmented Reality, Virtual Reality, and even a ride-on experience to bring the solutions to life. In addition, an adjacent R&D lab and maker space allow customers to engage with PTC engineers as they develop the next generation of innovative technology. A large café called “The Common” faces the CXC on the other side, providing plenty of seating for both employees and visitors. A large, open stair with a glass head-house connects The Common to the landscaped roof deck with outdoor seating. Los Angeles based, American Realty Advisors has acquired the building at 121 Seaport Square for $455 Million. Floors 3 through 11 at 121 Seaport are having electrical work completed including lighting power and fire alarm installation. 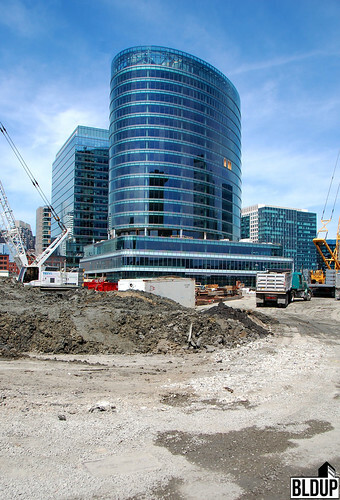 The new 17-story, 450,000-square-foot tower located in the heart of Boston's Seaport District. 121 Seaport will feature 400,000 square feet of Class A office space above a two-story, 50,000-square-foot retail podium. 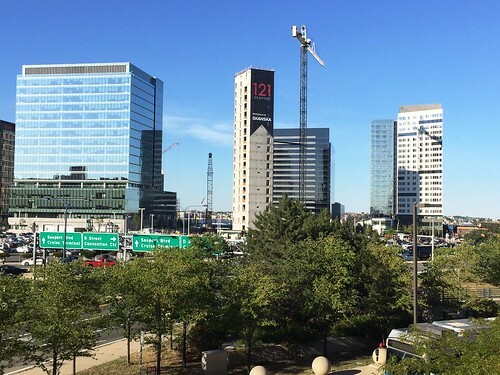 121 Seaport is 100%-leased, with tenants including Internet of Things (IoT) technology provider PTC, who has leased 250,000 square feet, and Alexion Pharmaceuticals, who has leased 150,000 square feet. Both tenants will open new global headquarters at 121 Seaport. Alexion Pharmaceuticals, currently based in New Haven, CT, will open a new 150,000-square-foot headquarters at 121 Seaport, bringing the state-of-the-art elliptical office tower to 100% occupancy. Last week, it was announced that Internet of Things (IoT) technology provider PTC has leased 250,000 square feet at 121 Seaport; the building features 400,000 square feet of Class A office space. Alexion, a global biopharmaceutical company that develops and delivers life-changing therapies for patients with rare diseases, will occupy floors three through eight of 121 Seaport and open its’ new headquarters in June 2018. Newmark Knight Frank represented 121 Seaport developer Skanska in both Alexion and PTC’s leases; Cushman & Wakefield represented Alexion, and Cresa represented PTC. “121 Seaport now being 100 percent leased demonstrates the Seaport’s arrival as one of Boston’s most sought-after submarkets and business destinations,” said Charley Leatherbee, head of Skanska’s Commercial Development operations in Boston, in a prepared statement. “We delivered a building based on flexibility, innovation, sustainability and efficiency. We are honored that a pioneering company such as Alexion selected our building. Alexion and PTC are moving their respective industries forward in a building that pushes the boundaries of traditional design.” 121 Seaport will open in the first quarter of 2018, and also features 50,000 square feet of prime retail across its’ first two floors. 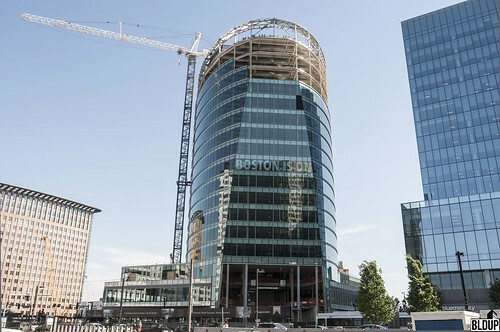 Global Internet of Things (IoT) technology provider PTC, currently based in Needham, MA off of Route 128, will open a new 250,000-square-foot global headquarters across the top half of the new 17-story 121 Seaport elliptical tower in the Seaport District. PTC has leased the space for 18.5 years and will take occupancy in early 2019. Over 1,000 employees across all PTC company operations will work at PTC's new headquarters. With PTC's lease, 121 Seaport is now 63% leased. PTC employs over 6,000 people worldwide and is a market leader in IoT and augmented reality. The company is developing technology that transforms how companies design, manufacture, operate and service the “things” in IoT. 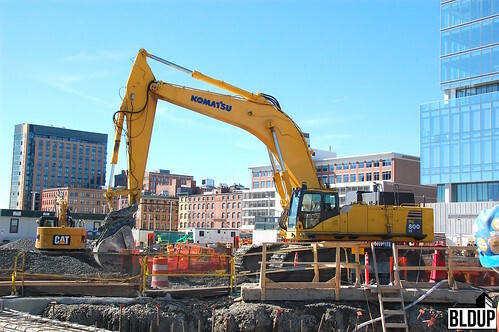 PTC has been headquartered in the Boston area since its’ founding in 1985. By moving to the Seaport District, PTC aims to enhance its ability to attract and retain talent, following in the recent footsteps of major players including Amazon, Boston Consulting Group, General Electric, PwC and Reebok. “There are few places in the world that can lay claim to as many ‘firsts’ as Boston,” said PTC CEO Jim Heppelmann in a prepared statement. “It is clear that this region has the opportunity to yet again become a beacon of innovation in technologies as disruptive as the Internet of Things and Augmented Reality. 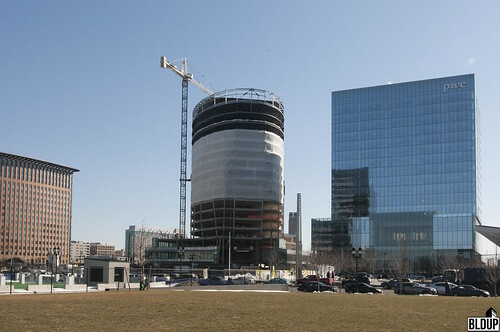 At PTC, we aim to be a catalyst to extend Boston’s global reputation as a hub for technology leadership.” The Class A, LEED Platinum-configured 121 Seaport is on target for completion in the first quarter of 2018 and features 400,000 square feet of Class A office space on upper levels, with 50,000 square feet of retail space across two stories at the building’s base. 121 Seaport’s sweeping elliptical glass curtain wall facade has been fully installed across all 17 of the tower’s floors. The facade features floor-to-ceiling high-performance vision glass, resulting in sweeping views of Boston Harbor and the Boston skyline. 121 Seaport’s elliptical design reduces wind loads and gives the building less direct solar exposure, resulting in 15 percent energy savings. 121 Seaport is built to LEED Platinum sustainability specifications. Skanska has announced it will construct a new interactive pedestrian museum at Harbor Way, the 20,000-square-foot, 70-foot-wide pedestrian promenade between its’ recently-completed 101 Seaport and under-construction 121 Seaport office and retail developments, honoring the history of the area’s development. 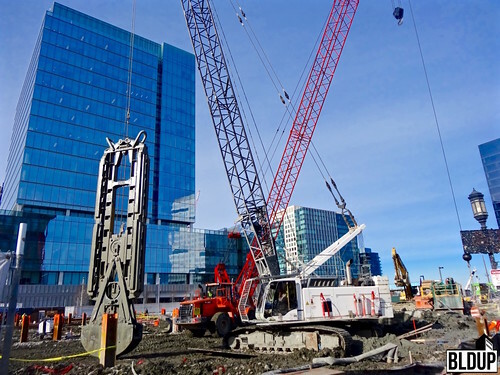 The museum will focus upon Skanska’s discovery of an old shipwreck below the 121 Seaport construction site in May 2016, highlighting the landmaking of the Seaport District that caused the ship to be found a few blocks inland from Boston Harbor. The museum will explain how the Seaport District was once a tidal flat, which was filled with land in 1896, burying the old shipwreck. The museum will include facts about the ship’s last journey from Rockland, Maine and artifacts found within the ship, as well as the Seaport District’s initial use as a vast rail yard. "Boston has so many underground secrets and mysteries yet to be discovered. The shipwreck was both a surprise and an eye-opening experience and sheds new light on both the history of Boston's Seaport, and the historic connections between Boston and the rest of New England,” said Joe Bagley, the City of Boston’s Archaeologist. 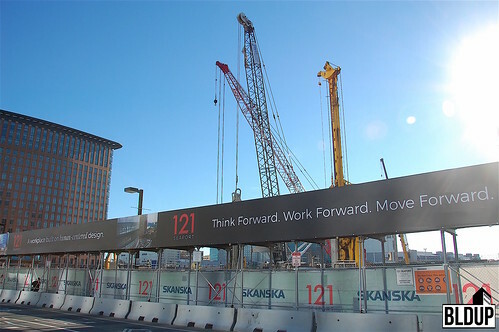 Skanska has released a new interactive website, 121seaport.com, with leasing information for 121 Seaport, a state-of-the-art 17-story, 450,000 square foot tower under construction in the Seaport District. Additionally, new interior and exterior renderings have been released; these renderings can be found above. 121 Seaport will feature 400,000 square feet of Class A office space above a two-story, 50,000 square foot retail podium. 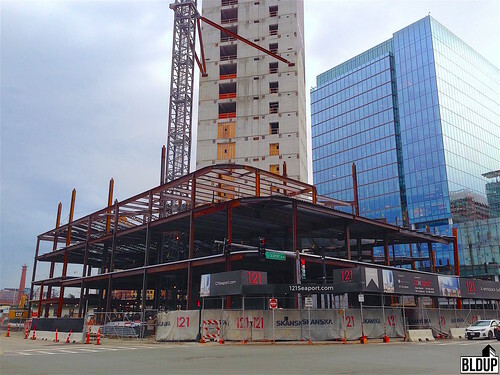 We are excited to observe construction of Skanska USA's 121 Seaport office tower! The building broke ground on July 9th, 2015.